SEAGLASS 74 - "The Ultimate Cruising Yacht." The modern clean lines of the PC74 have been skillfully created from the drawing board of renowned designer, JC Espinosa of ESPINOSA INC. Known for his charm and flamboyant character, but more so for his flair for designing very elegant mega yachts, JC Espinosa has produced a stunningly beautiful catamaran with free flowing lines, a superstructure that is pleasing to the eye and draws your attention to study her complex “simplicity”. He has also created a luxurious, plush interior, which will set her apart. She certainly will appeal to the “Cruising Connoisseur”. is a magnificent, luxurious cruising yacht that offers the comfort, privacy, amenities and space one would typically only find on much larger motor yachts but without the associated purchase and running costs. She will appeal to a broad segment of yacht owners, either for private use or for charter. 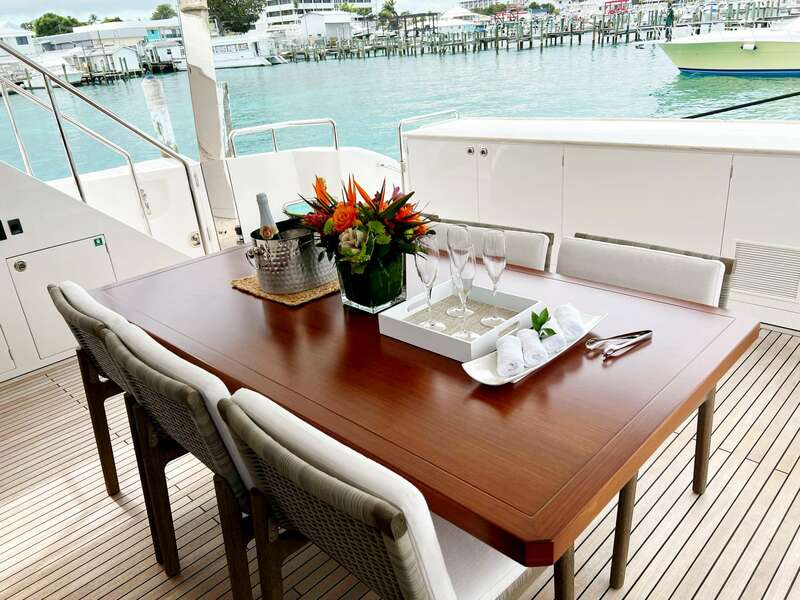 Key elements of SEAGLASS 74 are; Elegance, Stability, Efficiency, Performance, Luxury, Space, Privacy, Amenities, Safety, Maneuverability, Ease of Maintenance and Eye Catching Dock Appeal. 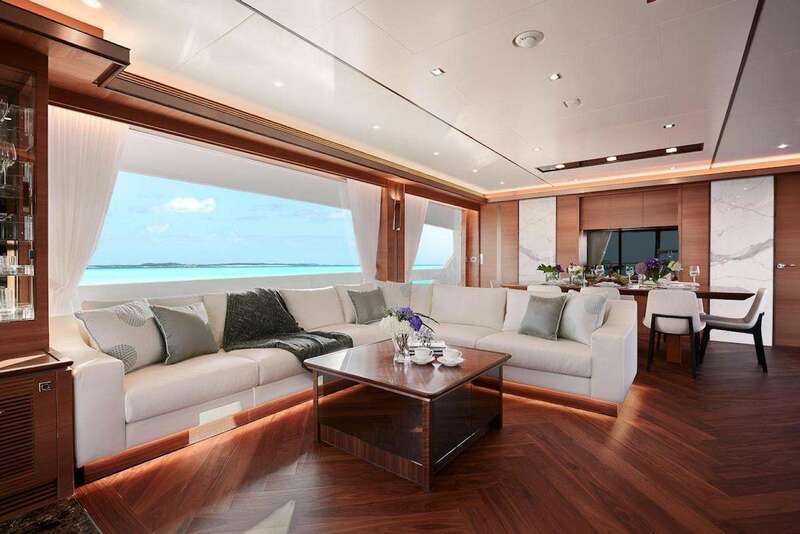 It is fair to say that no other yacht of her size offers everything that we have successfully designed on SEAGLASS 74. The well esteemed charterer will appreciate the main deck, with all the primary living areas on a single level, including the massive aft deck with dining for 10 and lounging for 8, a bar and ample storage lockers. The large saloon offers seating for 8, separate inside formal dining for 8, gourmet galley with island and bar with 4 stools. 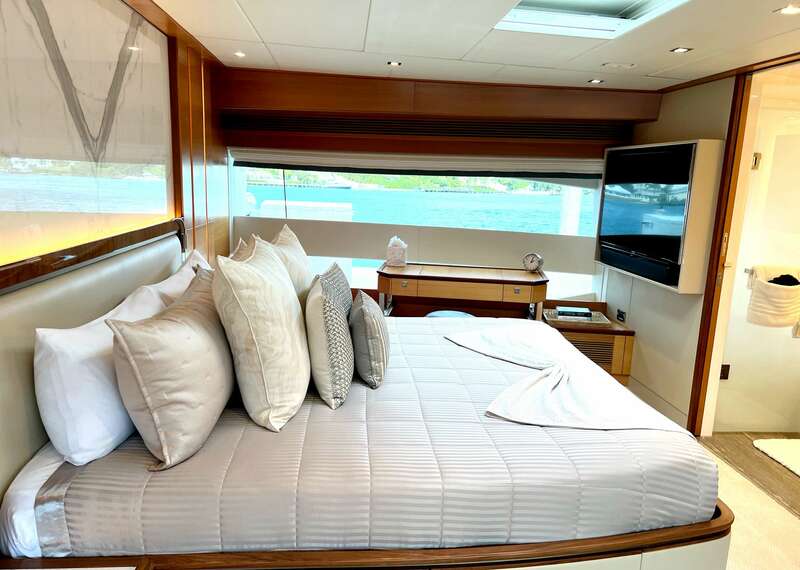 Forward on the main deck is the glamorous full beam master stateroom with walk around King bed, 180 degree views, spacious en-suite bathroom, sofa, vanity and ample storage. 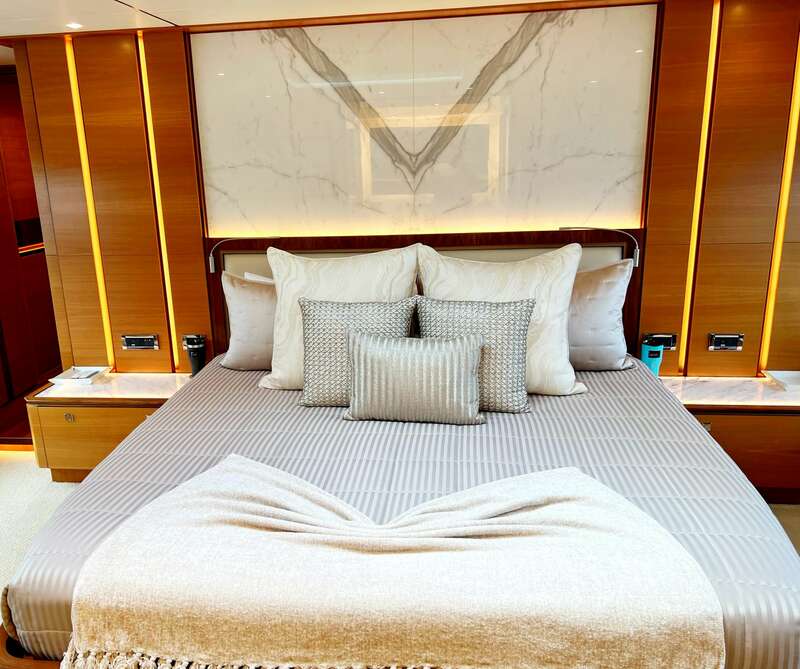 The lower decks offer two large King VIP en-suite staterooms, port and starboard forward. The fourth guest en suite stateroom, port aft; can be configured to accommodate couples or 3 children. 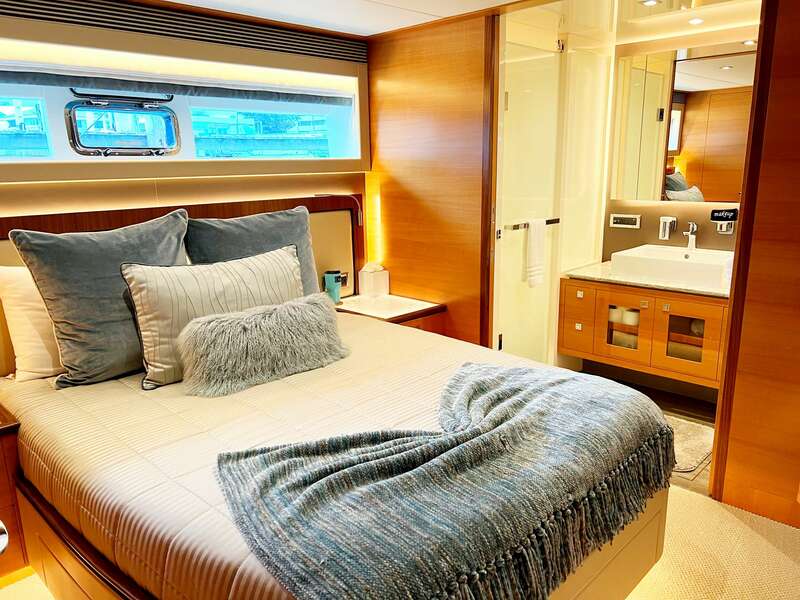 The crew cabin, for 3, is in the starboard aft section of the yacht,and has a separate bathroom and kitchenette. Note that each cabin has a separate entrance, offering privacy for everyone aboard. 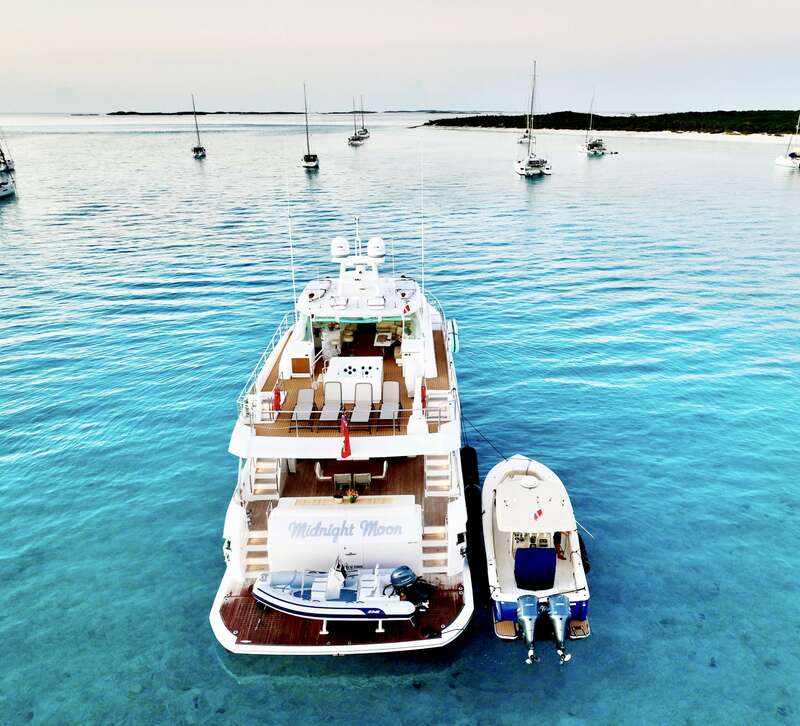 The Flybridge is an entertainers delight, with large comfortable dining / lounging for up to 10, a well equipped bar with seating for 5, a day head, separate BBQ area and dinghy stowage plus loads of room for chaise lounges once anchored off a secluded beach in an exotic location. 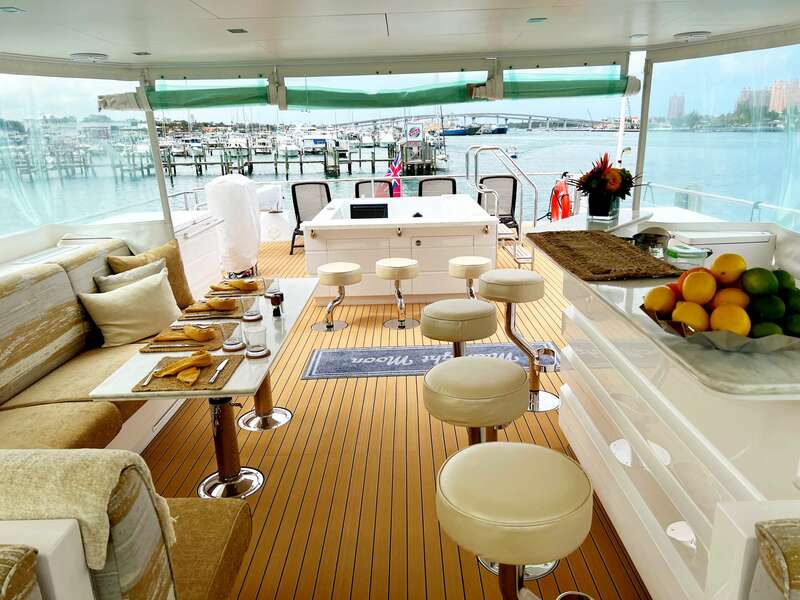 The aft deck Hi/Lo swim platform, suspended between the hulls, ensures that everyone can access the water with ease.The foredeck offers two large sun pads and bow seats. There are 5 large storage areas for fenders, lines and water toys.